My twin bro, Victor, tagged me. So here's my story. Dats about it -- only Angie gets to go on da deck. Waving my paws to try and get more treats! My two beds - stay away! And anyone else who wants to play! Know what to do? Copy this list and paste it into a new post wif yur own answers. Then pass it on. If it's too long, skip some questions an nap whenefur you feel like it - you're a cat and don't have to do what anyone tells you. I gots an OWIE again! Dis time I jumped on da stove and it was still HOT! I know I did dis before but I forgotted. Da last time it didn't hurt dat much but dis time it HURTS. Mom tried to put ice on it but I wouldn't let her. Update: I gots blisters it looks like on a few toe pads. Plus I keep wavin my paw in da air. The good fing is that is my signal to gets temptashuns when I play the slap me five game wif mom. So I keep going to high five her and she gibs me treats coz she feels so bad dat my paw has da owie. 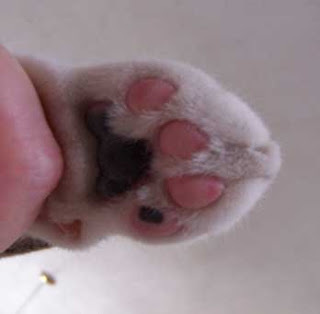 See my paw? Mom says it looks the same as it always does wif a little pink on dem pads but there might be a little white around da black on da last toe pad. It might be a blister. I don't finks I'll be jumping on da stove again. 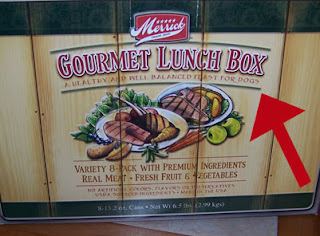 Mom went to owr favrit food store to stock up on stinky goodness. She saw this reely cool looking 'sortment of stinky goodness cans. Dis is the stuff dat makes the Thanksgiving meal in da can too. But when she got we saw somefin that just didn't look right. It was food for WOOFIES not CATS! Hahahahahaha ! It looked so good we wanted to eat it anyways but she wuldn't let us. 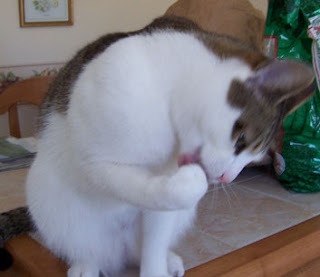 In celebration of our blogiversary, ferst Beau Beau found a spidey and ated it fur brekfast. 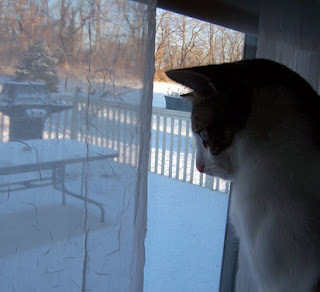 Den we reflected on owr ferst year by lookin out da window. The beans said from da looks of owr picshure it should be big buttaversary! *Hey, you should talk, woman* It's been a wonderful year and we am glad we met so many of the cat bloggers. Efun though we haf only been around a year we have seen the cat blogging community grow. This year we have learned and done lots of fings like: how to be most effective in waking up the hyoomans in the morning, how and when to take the best naps, how to use the 'puter better, met furry funny kitties (Skeezix is one of dem), met a sweetheart handscome boy cat (Cocoa), how to be nicer to ofur hyoomans, how to help ofur kitties and hyoomans, how to pray better (Beau), what kinds of good stinky goodness efurryone eats, what ham is and how good it tastes (fanks you Miles and Sammy), how to read a reeely good book (fanks Max), all about the paw signals in the Superbowl (Kimo & Sabi) and most importantly, how to haf a reeely good party! Those fings were just some of the long list of fings we learned and did this past year. There are so many ofurs way to long to list. Fanks efurryone just fur being there. 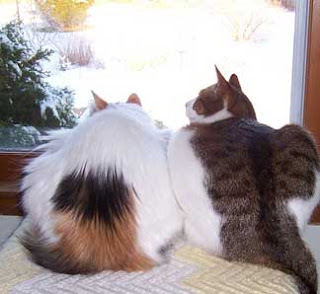 Read da story about Momma Cat Adopts Rottweiler puppy. A momma kitty actually is feeding a woofie! The story is from the Meriden Humane Society where owr humans adopted us from! It's the same place dat we just made owr donation to today. We dropped off some cat litter and some cat food and the donation (a $50 gift certificate to Petco) wif all da names of efurryone who signed in on the comments after da party. Fanks for signing in! Meet Chinook. He needs yur help because he needs a new home. One of his humans is a co-worker of owr Mom and she has asked fur help in finding him a new home so he can have a happy, stress-free place to live. Chinook currently lives in Pennsylvania somewhere about 45 mins from the Princeton, New Jersey area. 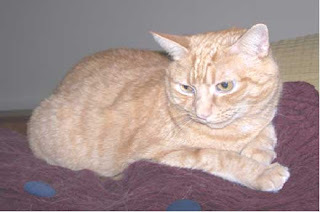 Chinook is a 4 1/2 year old male cat. He is neutered, four-paw declawed, and current on all of his vaccinations. He is an extremely affectionate cat who likes to sleep in your lap while you watch TV, lay on your desk while you are checking your e-mail (he must be a blogger in the waiting), and sit in the bathroom while you are brushing your teeth. He sleeps on a pillow close to you at night. Chinook is great with kids and younger cats. He does not like older cats. He tolerates dogs, but would prefer to be an only cat in a home without dogs. His owner's really like Chinook, but because of their German Shepherd and Golden Retriever, who stalk Chinook around the house, he has developed a habit of spraying his territory. If he is secluded away from the dogs, he does not spray. 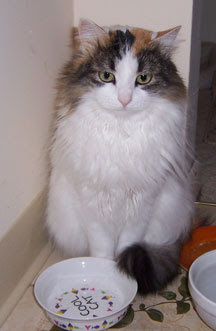 Chinook needs a loving home where he can be as affectionate with his new owners as he is with his current owners. If you know anyone who is interested, please leave a comment or email us and we can put you in touch wif his current family. 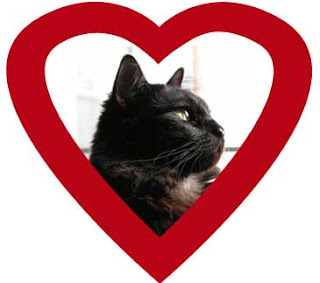 And a Happy Valentine's Day to all our blogging furriends. Cocoa sent me a present! 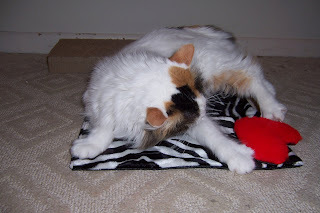 Cocoa sent me a Valentine's Day present! I lufs my Cocoa. I had such a good time opening my present. He must know how much I likes da nip. 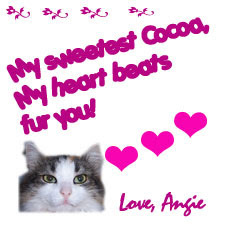 Fanks you Cocoa sweetie! He sent me a heart and some nip and a pillow. He's a real nice Valentine. There is still time to leave a comment here wif yur name and we will add you to the total list so's the donation will be reeely big (we are donating .50 cents per cat or ofur furriend who signs in on owr comments here). The more names, the bigger owr donation (up to $100). The total so far is 106 111 120140 for all who signed owr comments and/or attended the paarty.We needs 80 to leave their names to get to owr max of $100 ($50 fur Robyn and $50 for Meriden Humane Society). So leave a comment wif yur names. Fanks! This morning there were a few squishy pillows left around and we efun saw some of the crabs were still alive and kicking. We thot we got them all but some seemed to haf escaped. Anyone who is missing anything you left behind, please stop by and check out the lost and found box. There are a couple hair bows and it looks like a piece of a suspender??? Anyway, please come on in and pick up anyfing you left. Thanks! Scooby, Shaggy & Scout, & the 3 guinea piggies: Eddie, Emma Sue & Sasha. How: This is Live Chat Party! Don't furget to sign in da comments here to be counted fur owr donation. Don't furget: All cats and buns and rats and ofur furriends please sign in when yoo come to the party so we can keep a good headcount for our donation cawse. In light of this being Robyn Appreciation Day, we has decided we will donate .50 cents for each cat (and buns and such) who signs in (not to exceed $100) to 1/2 to Robyn's fund (see the linkies below fur more information) and the other half to the Meriden, CT Humane Society (where we were adopted from). You can start signing in on da comments now if yoo want. And don't furget to go check out Cheysuli's blog too. 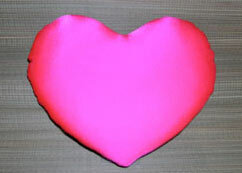 These luxurious squishy heart pillows will be handed out to all cats as they enter the party. 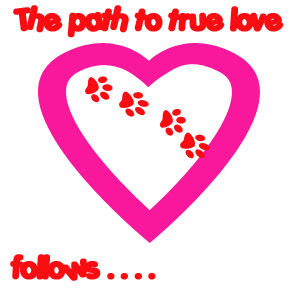 This is to enshure that you all have a BIG HEART *and it's good fur laying down yur purty heads and taking a quick nap*. The list of food starts wif Kiss Cookies. Den we has bowls of owr favrites - Temptations in assorted flavors. 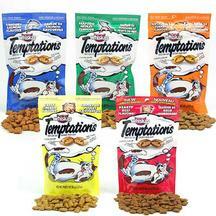 In addition to Temptations we have all assorted kinds of stinky goodness since efurryone likes all kinds of differnt foods. We want efurryone to be able to enjoy whatefur dey like bestest. If yoo like vishus deer we has it. If yoo like vegetibbles we has it. If yoo like chick-hen we has it. Get da picshure? Next we has some speshul kinds of foods like bowls filled with Smelts fur dem fish lovers. 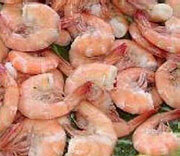 And who could go wifout Angie's favrit -- Shrimp! 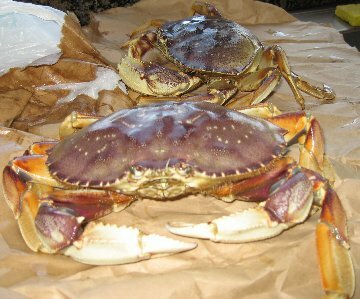 And fur owr Catifornia furends and dose who can't get these so often, we has crabs. Wait! ACK! - we finks dese are still LIVE! Moooommmmmm! Hurry and cook up da crabs - dey are waving dere clawsies at us! 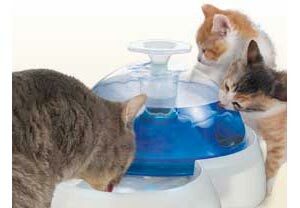 The will be a community drinking fountain to keep all cats and furriends hydrated after all the playing. The water fountain will provide a continuous flow of fresh clean water. Plus there are all kinds of assorted juices and some milk and cream for those who can tolerate it. 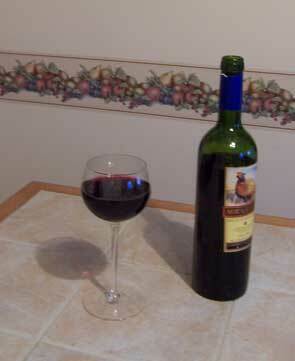 There will be wine fur any hyoomans who happen to wander in and dare is plenty of it. 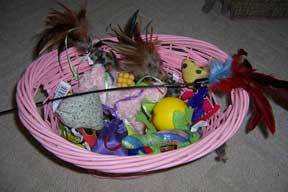 Here am our basket of toys dat efurryone can help demselves to. We efun haf some little bags of catnip in there. 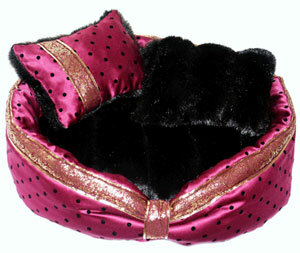 The Paris Nights Pet bed is here for those who wish to nap in complete luxury. Maybe there will be a King and Queen of the party perhaps? 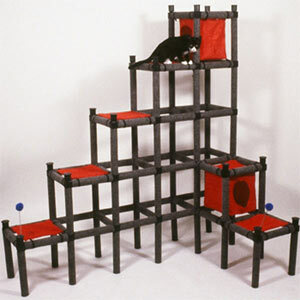 The Stairway to Cat Heaven dat comes frum Catplay.com houses Six Plush Fur Hammocks™ plus the roof of the condos provide a choice of areas for resting and sleeping. All cats will really enjoy this fur resting and fur climbing. 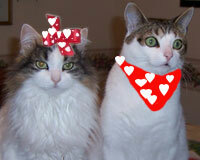 It am speshully nice fur da partay since the hammocks are in a nice red color to complement Valentine's Day. 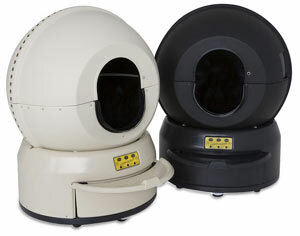 His and Hers Automatic Litter-Robots. Dey will be clearly identified so each girl and boy cat knows which one to go into. No stoopid confusing picshures will be on dem. The name "girl" or "boy" kitty will be written in cat language on the outside of da box to insure yur privacy..
Dat's all we can finks of fur now! ENJOY YURSELFS! 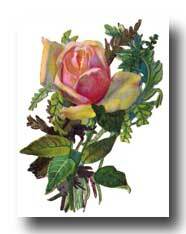 One more fing --- An fur the finale -- All da girl cats can takes a rose home wif dem. p-ess. We linked to da sites that da images came frum in case yoo enjoy dat item soo much you just gots ta haf it. Espeshully if yoo like da food and da luxury paris nights bed, right Mom? 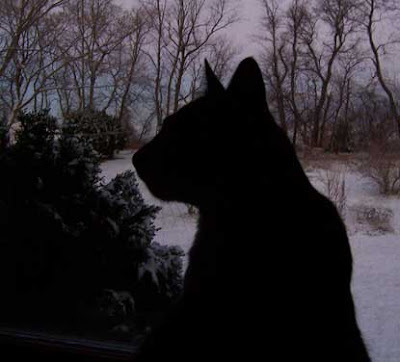 On Cheysuli's blog they have posted that they will donate .50 for every comment (though it's one comment per cat) up $50.00 with the rest to be donated at the first of the month. They sais to let everyone know and come by! How: This will be a Live Chat Party! 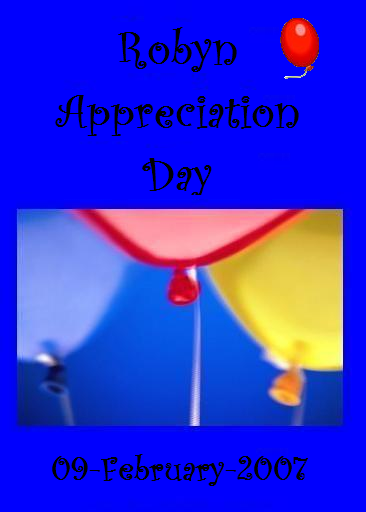 Instrukshuns will be here just before the party starts at 8PM EST. 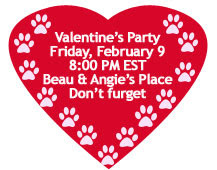 Don't furget: All cats please sign in when yoo come to the party so we can keep a good headcount for our donation cawse. In light of this being Robyn Appreciation Day, we has decided we will donate .50 cents for each cat who signs in (not to exceed $100) to 1/2 to Robyn's fund (see the linkies below fur more information) and the other half to the Meriden, CT Humane Society (where we were adopted from). Please visit Grr, Midnight and Cocoa's blog and Missy and KC's blog to find out about Robyn and all the good things that Hot(M)BC-Mom has done fur us all. 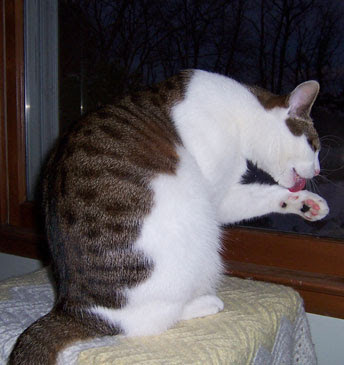 Gotta keep these toesies clean and clipped so they will be nice fur da party. Did I mention we has carpet which is really a full length scratching pad? How: It will be a Live Chat Party! Sanjee from House of the (Mostly) Black Cats is gonna help us out. 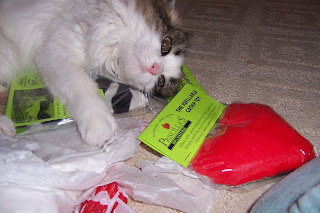 And just to make fings efun more interesting we decided we would donate 50 cents for each cat who signs in on owr comment page on Furriday to da place that we gotted adopted from, the Meriden Humane Society , and we will put da donation in all owr names. I'm ready! 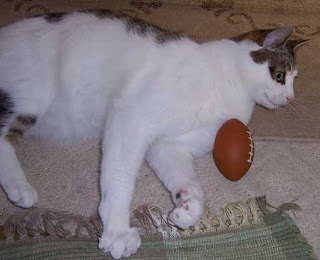 Where's my Superbowl extra stinky goodness feast? You made food fur me right? Yur not going to leave us here wifout owr own feast are you? Hrmph. Me and Angie will haf to go to a party if you furgot to get us extra speshul stuff. It's all about the food ya know. It finally snowed here in owr backyard. 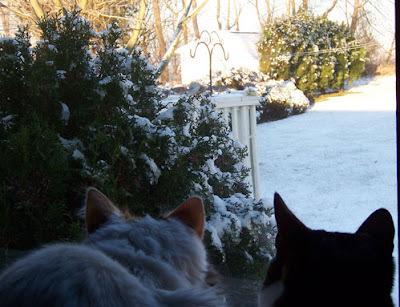 This was the morning view of da birdies eating breakfast. Yoo can see da birdies on da corner of da railing. Sometimes they come right to the tree in front of owr face and we has to duck so they won't see us. OK people where is my food? I used to be satisfied wif 1/2 a can but that's not enuf anymore. If this sad face doesn't make you feel bad enuf to give me more food I don't know what else I can do.